Films shot by D. Darian Smith, war service records and a radio interview. Also includes 3 albums of photographs taken by Darian Smith at the Mitcham AIF camp and whilst serving overseas in the medical corps. The photographs are of an informal nature and feature staff, places and activities. 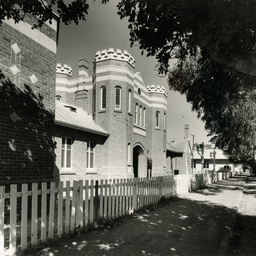 They range in context from the Mitcham Camp to a parade down King William Street, Blackboy Camp in Western Australia, ship board scenes on HMAS 'Borda' (travelling to Europe), Cape Town and Durban, English scenes but particularly the military hospital at Dartford, shots of Europe and the return trip aboard HMAS 'Devon'. Group of distinguished men, possibled the Dublin Council. Clement Smith is front left. To see a selection of photographs in this collection, search on Archival number PRG 1642/25. 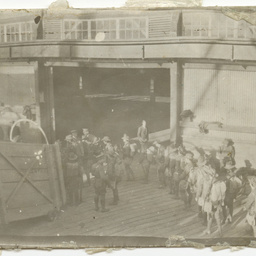 One of three photograph albums documenting D. Darian Smith's time overseas during World War I, with this album documenting the transfer of troops from Perth to England via Cape Town, followed by hospital, tourist, peace celebrations and aeroplane shots in Britain. 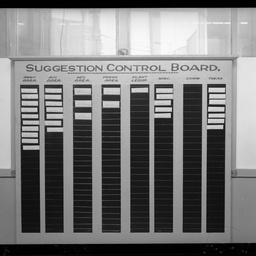 All captions are as they appear in the album unless indicated by square brackets. See 'contents' for details of items. One of three photograph albums documenting D. Darian Smith's time overseas during World War I, with this album documenting Europe's tourist spots and the return trip on HMAS 'Devon'. All captions are as they appear in the album unless indicated by square brackets. See 'contents' for details of items. A photographer Darian Smith about to board a light aircraft. 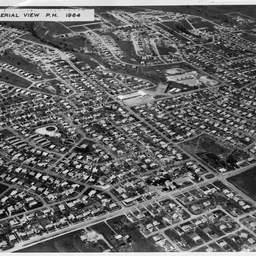 [General description] Berri township buildings, structures and paddocks form a patchwork when viewed from the air. The River Murray is seen on the left. [On back of photograph] 'Berri from the air / Photographed in 1933 by D. Darian Smith / Cutting from the Chronicle for July 27, 1933'. Photographs taken by D. Darian Smith of a Convent Garden Russian Ballet (Ballet Russes) performance at the Theatre Royal in Adelaide. 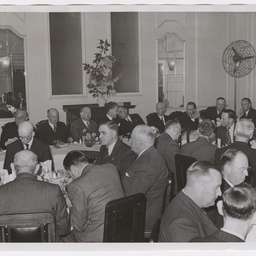 This was part of the Company's second tour of Australia which covered the period September 1938 to April 1939 (with the Adelaide perfomances at the end of the tour). 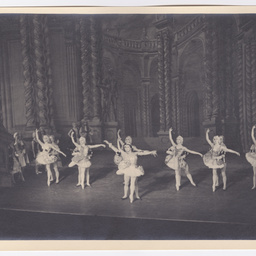 This particular ballet has not been identified at this time. Photographs of Beatrice Ford-Smith, her family, colleagues and displaced people in Germany whom she helped through her refugee resettlement work. Includes views of Bergen-Belsen concentration camp site in 1946, with Jewish memorials etc. See 'Contents' for details of 34 images. Includes photographs of Polish couple Lidia and Johnnie in Brunswick and at their new house in Golfer's Avenue, Seaton Park SA. 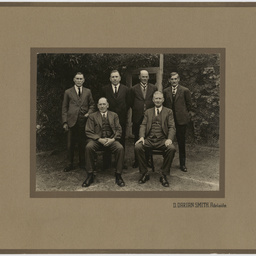 Other photographs taken by B. Ford-Smith in 1947 and 1950-1951, including while on leave in Europe and UK, have not been digitised and are housed in sleeves in envelope. 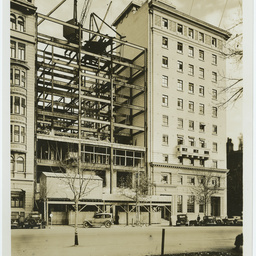 Steel framework supplied by Forwood Down & Co. being erected for the Elder Smith Goldsbrough Mort building on North Terrace, Adelaide. 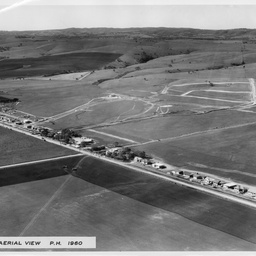 View of a largely rural Para Hills, with cleared paddocks and houses strung out along the road. According to a researcher, this photograph is looking North East and the main intersection is Kesters Road/Bridge Road. See D 7974/13(Misc) for the same area four years later. View of the same area shown in D 7974/13(Misc), but now covered in housing. According to a researcher, the main intersection in this photo is Bridge Road/Kesters Road. 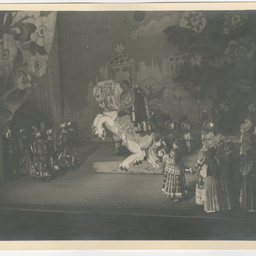 Photographs of a performance of the 'Le coq d'or' ballet presented by the Convent Garden Russian Ballet (Ballet Russes) at the Theatre Royal in Adelaide. This was part of the Company's second tour of Australia which covered the period September 1938 to April 1939 (with the Adelaide perfomances at the end of the tour). 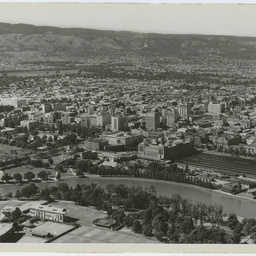 Comprising a collection of 34 aerial photographs of Adelaide city and surrounds by prominent South Australian aerial photographer D. Darian Smith. Collection includes early views of Adelaide, Port Noarlunga, Port Adelaide, Barossa Valley, Murray River areas and Victor Harbor. See also http://memorybank.atkins.com.au/galleries/ddariansmith viewed 1/2/2018 . See also James Dodd diaries SLSA D 7968(L). 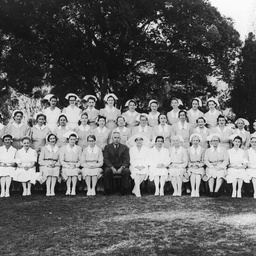 Large group of trained nursing staff with the medical superintendent (Dr. J. Rollison in the centre front row) at the Royal Adelaide Hospital. Matron Maxfield and Assistant Matron K. Scrymgour on his left. 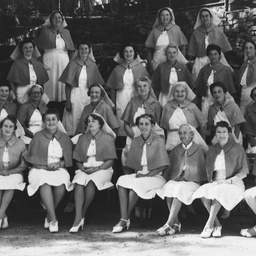 There are 39 Charge Nurses and Staff Nurses arranged in 3 rows. Back row L-R: Natalie Baker, Patsy Darke, Beatrice McNeil, Gladys Leverington, L.G.E. Gentry, M.D. 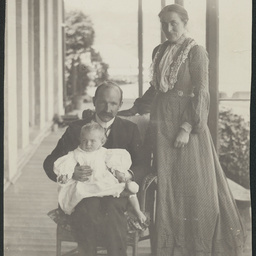 Wilksch, Margaret McLelland, C.L. Puckridge. Second row L-R: D.E.M. Bonney, Dorothy Clarke, (? ), (? ), (? ), G.D. Beck, E. Haycock, K. Bray, E. Paltridge, K.E. Plunkett, A. Steinle, Lum, (? ), Mayer, M. Dunn, (?). Front row L-R: D. Ridgway, M. Durdin, P.L. Forward, K. Williams, E.I.M. Johnston, M. Downing, J. Ingram, Matron J. Maxfield, K. Scrymgour, A. Allan, A.D. Henniker, M. Attenborough, (? ), E. Pleuckhahn, B. Julge, L. Smith. 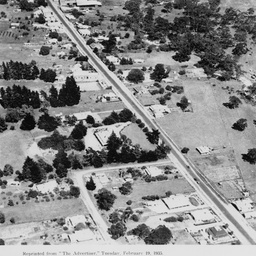 Aerial view of Birdwood. The text reads as follows: 'Reprinted from the Advertiser Tuesday February 19, 1935. Birdwood makes an interesting study from the air, with its setting of beautiful trees. The hills town is famous for its orchards, and is on the main road from Adelaide to Mount Pleasant. The road can be seen clearly in the picture. Photo by D Darien Smith'. 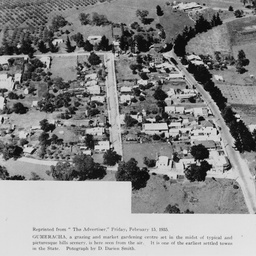 Aerial view of Gumeracha. 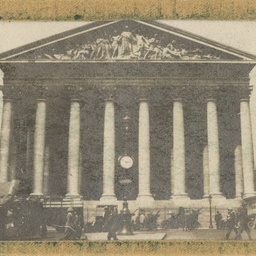 The text on the photograph reads as follows: ' Reprinted from the Advertiser Friday 15, 1935. 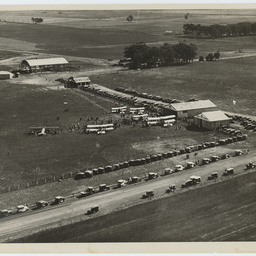 Gumeracha, a grazing and market gardening centre set in the midst of typical and picturesque hills scenery is here seen from the air. It is one of the earliest settled towns in the State. Photograph by D Darien Smith'. Portrait of Dr. Matthew Beovich, Catholic Archbishop of Adelaide. His Grace the Most Reverend Matthew Beovich, D.D., PhD. 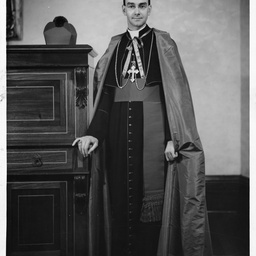 Matthew Beovich was consecrated and installed as Archbishop of Adelaide in St Francis Xavier's Cathedral in Adelaide on April 7, 1940. He became the Archdiocese's first Australian-born bishop. 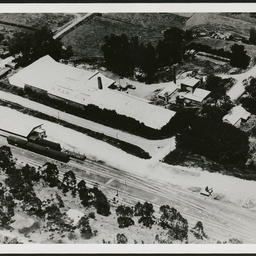 Aerial photograph of three tin sheds and a hangar under construction at Parafield. Crowds mill around the six airplanes in the paddock. 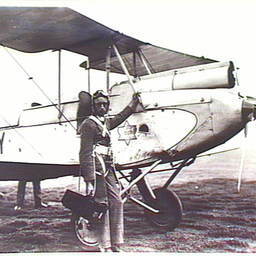 '...taken by Darrien Smith on a Club open day with three of the club's Moths and the Hilson Praga in view with Horrie Miller's DH61 and Bristol Airtourer in 1937...hanger under construction...was the one that...was occupied by Pacific Aviation and, before them, the Royal Aero Club of South Australia'. 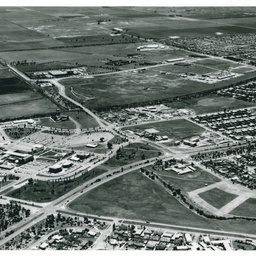 [Lataan, Damian, 'Parafield from Paddock to Airport', pg.36]. CHEER UP HUT: A group of volunteer helpers outside the Cheer-Up Hut; present are Ella Cole; Bertha Wildy; D. Farrow; Marjorie Morphett; Chris Christianson; Roz Gamlin; Bessie Sanders; E. Morley; J. Sanders; Enid Wallis; L.H. Pryzibilla; M. Gordon; Marjorie Raggatt; Kath Phillips; L. Hannaford; Gertie B. Dixon; Barbara E. Perriman; Isla Crump and Joan Reeves, order not known. View of the premises of Parsons & Robertson Ltd, mechanical and electrical engineers, at 172-174 Pulteney Street, Adelaide, with the staff lined up in front of the building. 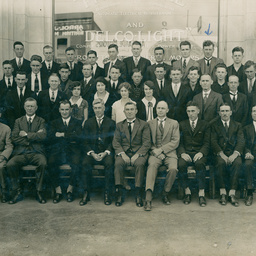 John Creedy is 12th from right (front row). 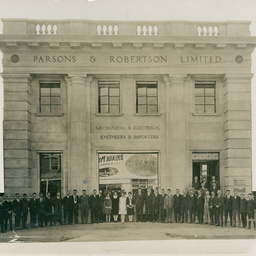 Staff of Parsons & Robertson Ltd, mechanical and electrical engineers, at 172-174 Pulteney Street, Adelaide, photographed in front of the building. John Creedy is 3rd from right (back row). 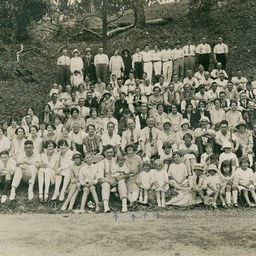 Staff of Parsons & Robertson Ltd, and their families, pictured at the company picnic at Belair National Park. The Creedy family is in the front row - John Creedy (third from left) holds son Maurice (aged 2) on his knee, his wife Gladys is on his left with Joy (aged 4) and Ruth (aged 6) beside her. 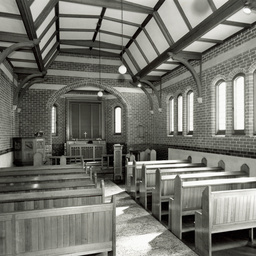 Interior view of the chapel at the Mission to Seamen building at Outer Harbor. The building was demolished in 2004. 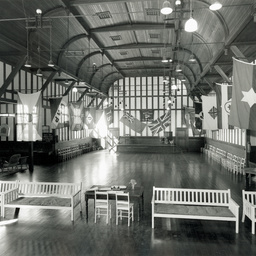 Interior view of a hall within the Mission to Seamen building at Outer Harbor. There are chairs and benches around the edges of the space, and various flags hanging around the room. The building was demolished in 2004. Exterior view of the Western face of the Mission to Seamen building at Outer Harbor, looking south. The building was demolished in 2004. The Official Table at an opening dinner fo rthe new Philips Factory at Hendon, at Hotel South Australia. Seated L-R: Mr. S.O. Jones (Technical Director of Company), Senator Finlay (representing Commonwealth Government), Mr. W.G. Forsyth (Vice-chairman of Philips Board), Hon. T.A. Playford (Premier of South Australia), Mr. F.N. Leddy (Governing Director of Company), Rt. Hon. J. McLeay (Lord Mayor of Adelaide), Mr G.S. Warburton (Director of Philips and Managing Director), Jhr. Mr. J.A. de Ranitz (Charge-d'affaires, Netherlands Legation), Hon. A.L. McEwin, M.L.C. (Chief Secretary and Minister for Health). 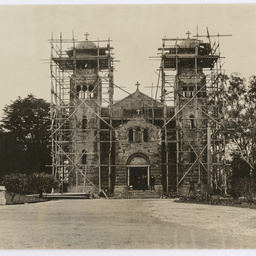 Chapel being erected at the Marist Brothers College at Brighton. Aerial view of Stanley Winery. Aerial photo of Elizabeth looking from south to north. 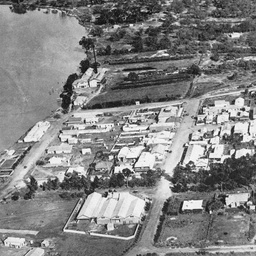 Elizabeth City Centre is to the left and the intersection of Main North Road, Philip Highway and Yorktown Road is in the bottom left of the photo.